This is for anyone who fancies a change from the traditional fruitcake. The hint of thyme in the sponge isn’t overpowering, and works in harmony with the tart cranberries and sweet white chocolate. 1. For the sugared cranberries, bring 50g sugar and 50ml water to the boil in a small saucepan. Once the sugar has dissolved, remove from the heat and leave to cool completely. Add the cranberries and set aside for 1 hour. Use a slotted spoon to lift the cranberries out and place in a small bowl. Sprinkle with 2 tbsp caster sugar, swirling to make sure they’re evenly coated. Place on a wire rack and set aside for 2 hours to dry out. 2. Preheat the oven to 180°C, gas mark 4; lightly grease 3 x 20cm cake tins and line the bases with baking parchment. For the cake, beat the butter, sugar and thyme in a large bowl, using electric beaters, until light and fluffy – about 5 minutes. Beat in the vanilla, then the egg whites a little at a time, making sure each bit is incorporated before adding more. Mix the flour, cornflour, baking powder and a pinch of salt and carefully fold into the batter in three additions, alternating with the buttermilk. 3. Divide the batter between the tins and bake for 25-30 minutes, or until the cakes start to pull away from the sides of the tins. Cool in the tins for 10 minutes, then invert onto a wire rack to cool completely. 4. For the compote, put all the ingredients in a small pan and cook over a medium heat until the fruit has broken down and looks a little jammy – about 10-12 minutes. Pour into a bowl and set aside to cool completely (this can be made a few days in advance and chilled). 5. For the buttercream, put the egg whites and sugar in a heatproof bowl set over a pan of simmering water; whisk gently with a balloon whisk until the sugar has dissolved. To test, rub the mixture between two fingers: if you no longer feel grains, it’s ready. Remove the bowl from the heat and, using electric beaters, beat for 10 minutes to a thick, stiff meringue that’s cool to the touch. Whisk in the butter a piece at a time, then mix in the melted chocolate. 6. To assemble the cake, place one sponge on a cake stand and top with ½ the compote, spreading it almost to the edges. Top with a layer of buttercream. Repeat with the second sponge. To finish, top with the final sponge and spread the remaining buttercream over the top and sides of the cake. 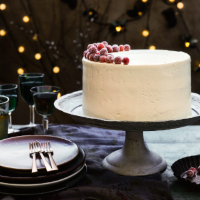 Decorate with the sugared cranberries and serve.